This is the second post in my Holiday Party Planning series. In the first post, I discussed how creating a Hostess Journal can really save you a lot of worry and drama. Along with reviewing my journal in the first week of November, I also dig through my stash of dinnerware and serving pieces to see what I am going to need for the upcoming season's dinners. Here is a quick recap of some of the best places to get your basic needs for the upcoming season. Personally, I believe in getting great basic white dishes that can be the base of your dinnerware collection. 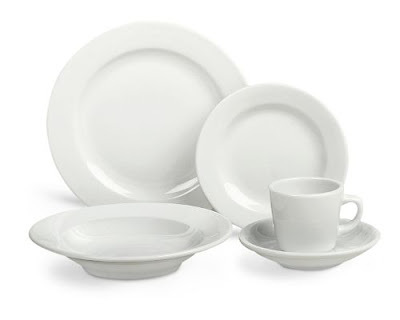 My favorite set for durability and classic lines is the Everyday Dinnerware collection from Williams-Sonoma. A 30 piece set (6 place settings) is going to run you around $89.99 on sale. This is a little pricey, but it is worth every penny because it is designed to work in the heavy use of restaurants. I have seen plates, bowls and cups dropped from anywhere from 3-6 feet onto the floor and remain intact. The linoleum below has been scored, dented and chipped – but the dishware itself is fine. To me, that is a good value because you aren’t going to have to replace it all the time. Now if you are having a larger group and need just basic plates to get you through your 10-15 person crowd, let me make some other suggestions. Over the upcoming weeks, keep an eye out for Buffet Plate sets in ads for under $1-2 a plate. Normally you can get 10-12 piece sets cheaply during this part of the year. 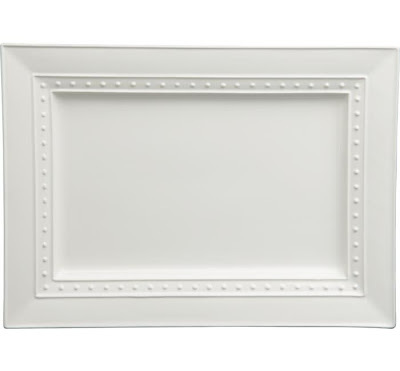 Check out this cute 12 piece Appetizer Plate set for only $10.50 from Crate and Barrel. These would be perfect if you are just doing appetizers or for dessert. If you want to add some more color to the tablescape, then just head to your local dollar store or discount retailer and stock up on the open stock dinnerware or closeout sets. Again, keep it basic and keep it white and it will always match everything. I love getting the sale stuff at Crate and Barrel. 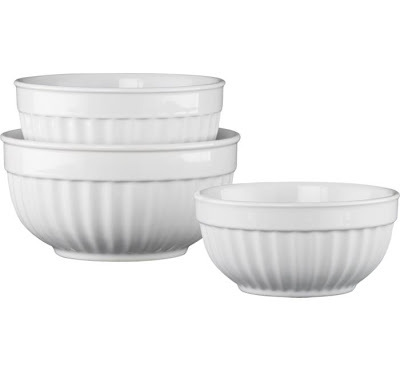 Like this great Nesting Bowl set for $21.95. Or this great Platter for only $7.95. 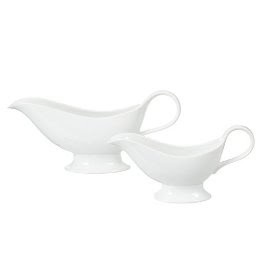 Or these two Gravy Bowls from Target.com for $11.69. What are your favorite sources for your Dinnerware and Serving needs? I would love to know where you go to for your basics. Please share! I am linking up with Works for me Wednesday! Stay Tuned – I reveal some great places to get Glassware and Flatware tomorrow!! I completely agree with the suggestion to use white dishes. Food always looks so nice served on white pieces. It is also so easy to replace if a dish breaks. Target and Pier I are both good sources. You and my mom must take notes from each other. What great ideas. Looking forward to seeing tomorrow's tip. Morning! Popped over here from the Inspired room. I am so glad I did. 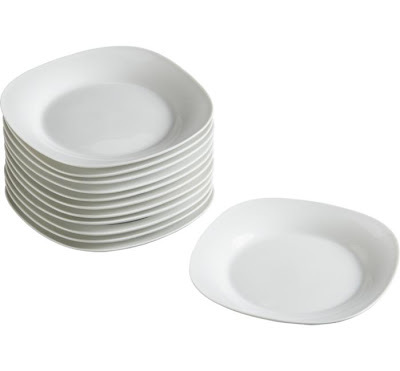 I have been looking for a good set of white dishes and haven't found any that get good reviews or been in my price range. I am going to have to check these Williams-Sonoma collection out. I love the white dishes idea and that is what I have been working toward in my home. I don't have a complete set yet, but can see how they would be so perfect to mix and match for any occasion. Great tips!!! Love to entertain and look good doing it! White dishes are so classic and can be styled in so many ways! Love your featured choices! Can you check the link on the rectangular dot platter? I love that item, but I keep getting a 404. Thanks! !